There are hundreds of thousands of Evangelical Americans running around telling you, me, and a whole lot of other people what God is like, what He has done, who He is going to judge, and how it all ends. But here is the truth…no one really has absolute knowledge of any of it. And when we try to tell someone “the Truth” it sounds more like arrogance and pomposity. We claim to know absolute truth about the creation, the reasons God judged and continues to judge sin, what the Bible “plainly” says about any number of issues, including American politics/social issues, hell, heaven, salvation, the end of the world. We seem to have all of it all figured out. What if we are wrong about some things, what of we just don’t have it quite right. What if we allow too much of our 21st century American thinking to color what the Bible really says. I mean, you and me and every other Christian is fallible, so who are we to judge anyone? I certainly am not. At this time in my life I struggle intensely with my faith, with the direction of my life, and the choices I have made and NEED to make. I remember when I was a “fresh pressed” Evangelical. I was on fire! I knew without a doubt who/what God hated, who/what He was going to judge, and how I needed to act in order to curry His favor. I remember telling people, unless they stopped smoking, drinking, watching television, listening the “devil’s” music, celebrated Halloween, teaching their children that Santa (aka Satan) Claus was real and a multitude of other “sins” that they were in danger of the unquenchable flames of Hell. And everyday I knew that Jesus was coming back to take us, the elect, to heaven and burn up this filthy, wicked world and all the “sinners” with it. And we would be standing around Heaven rejoicing in the destruction of billions of souls. Now I question, because everything in our faith is not cut and dry. In fact, most things are shades of gray rather than black and white. It makes me really angry when I hear a brother or sister in Christ pontificating on how the Bible is clear on this or that issue. Because we really don’t know it all. The Bible is not always clear, and if you take verses out of context like many people do, it becomes even murkier. 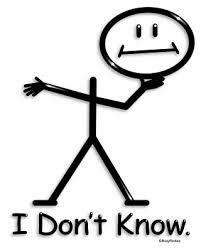 I use to have all the answers, but these days I have mostly questions. The Eastern Orthodox has often spoken of God only in the negative–God is not hate. God is not …. Because if God is truly bigger than us and other than us–than to speak of God as if we can define him–we are being quite arrogant and vain in our speech. Acknowledging the wide-breadth of Christian theologies on every possible topic and doctrine, humility would be the best course of action. Our doctrine should not be stumbling blocks for others but offer room for everyone to believe.